Sphene is a fairly rare stone and is classed as collector's stone and this 16.27 ct stone from Madagascar is a brilliant gem, with a diamond like luster and fire. 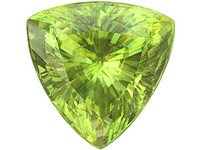 Pictured gemstone is perfect for pendant and maybe for the designer ring, if you don't go out and chop wood with it on. Like tanzanite, sphene won't take rough wear. If used for the pendant, where the light can react with it best anyway, you will have very unusual and rare piece of fine jewellery.